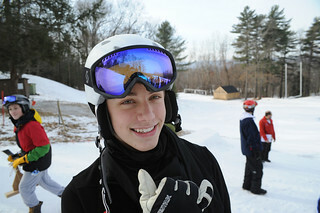 The 92nd annual Eaglebrook School Winter Carnival was held on Saturday, February 1. The day was kicked off with the cardboard seld race between Headmaster Andrew C. Chase '73 riding in his Eddie the Eagle sled, and the winners of the cardboard seld design contest held on Friday. This year, the Mexican spacecship took the honors. Eddie the Eagle won the race handily. After that, there were more cardboard sled races followed by the three-legged race, the klondike race, jack jumping, slalom races, ski/snowboard jumping, and lots of hot cocoa drinking. Mayer House took the Winter Carnival trophy, squeaking by with a two-point win over the next closest dorm.